Just like any other girl in this world I’m totally obsessed with Pinterest!! I find myself pinning for hours until I realize that this has become an unhealthy past time 🙂 For those of you who are not familiar with this great site, it is a tool for collecting and organizing things you love. I’ve been interested lately in finding some organization space for all my products, that I have decided to share 9 of the best ideas I found on Pinterest! 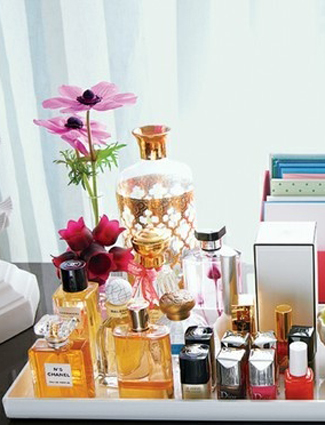 When cosmetics are crammed inside drawers and cabinets, it can be very hard to find what you’re looking for. 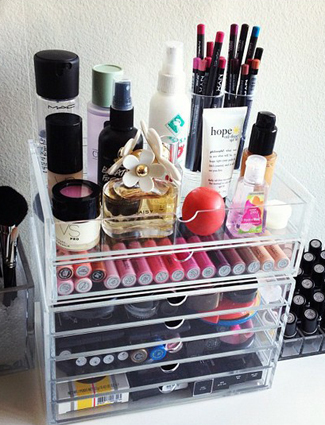 Use clear acrylic drawers that will allow you to scan without having to dig through 20 different lip glosses. 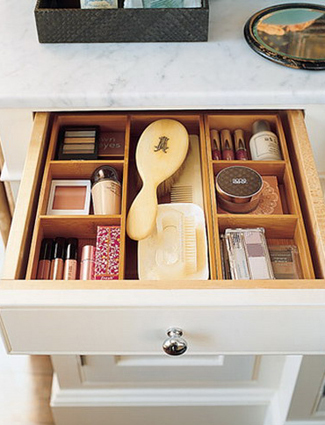 Drawer dividers have a way of instantly making your makeup drawers look organized. 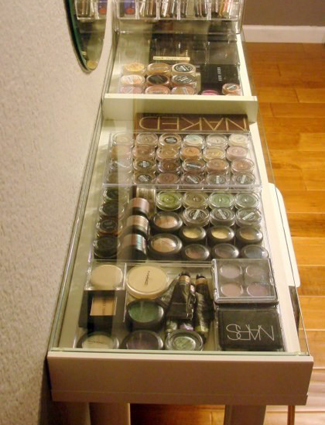 Take it a step further by grouping like items together (lipsticks with lipsticks, blushes with blushes, etc). If you don’t have a beauty board yet, get on it! Drape a metal sheet in fabric, frame it, and hang it on your wall. Glue magnets to the back of your products and stick them to the board. Sound like too much work? Stick velcro dots to your wall and to the backs of your products, and keep them off your floor that way. 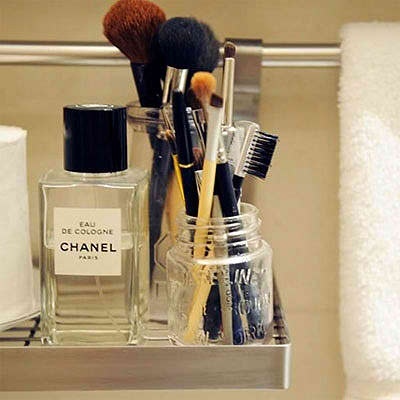 Want to keep your makeup brushes organized in a pretty way? Fill a small vase and stick the brushes inside. Too often we only use half of the space allotted to us. 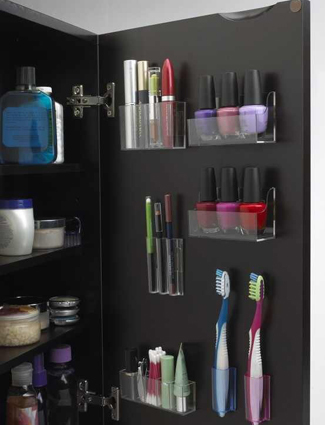 Stick acrylic holders to the insides of your cabinet doors for extra makeup space. The problem with most nail polish storage ideas is they hide the actual colors. By displaying your polishes on a small cake stand on top of your vanity, you’re able to see all the hues with a turn of the plate. If you want over-the-top OCD-like organization, group makeup together by product, then by brand, and then by color. Friends will be amazed at how well you keep it all together. 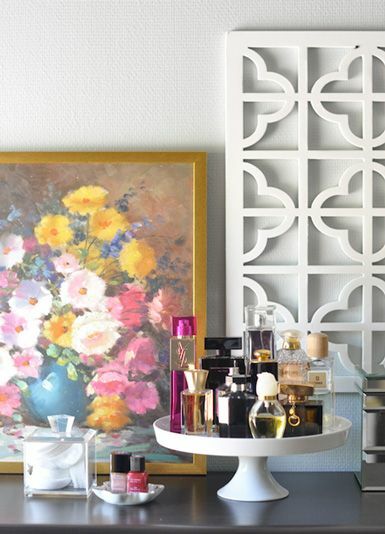 There are some perfume bottle and skin care jars that are just too pretty to hide away in a drawer. 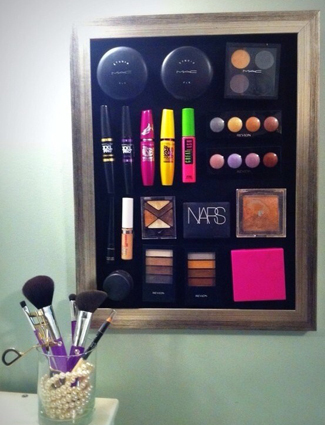 Instead, use a tray (or repurpose a picture frame), and display all of your best items for everyone to see. For the true product junkie, these clear plastic shoe storage sheets are a must. They hang from your door, and you can add labels to make finding the right eye shadow easy as pie. I’m totally in love with all these ideas and I do plan on making a future post on the one that fits my organizational skills the best I can’t wait to show you the outcome. Which one of these projects will you be attempting? Leave a comment below.